We are delighted with the success of the September 23rd blade relighting event that capped off a year of Centennial Celebrations! Thank you to every one of you for the support, time, energy and funds you have dedicated to this important year in the Paramount Theatre’s rich history. 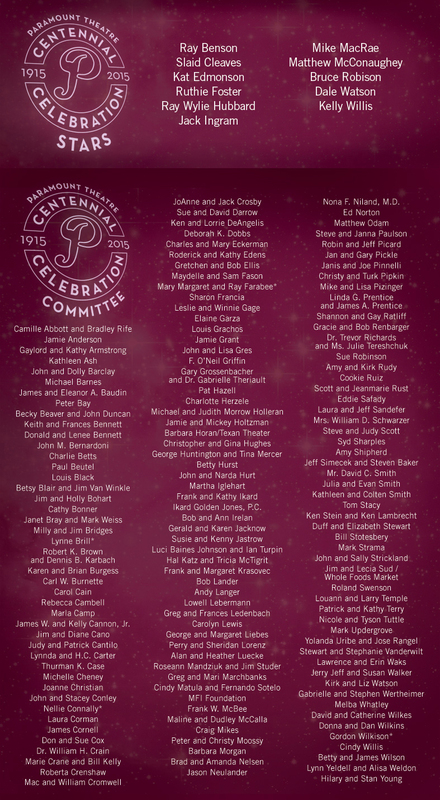 A special thank you goes out to our Centennial Stars Committee who have helped us remain vibrant and in the spotlight. Each one has graced our stages or screens, and have been great friends to the Paramount over the years. In January, we launched the Paramount’s 100th Anniversary by announcing our Centennial Celebration events – from free movie nights tied to our history, relighting our long-lost blade, to parties, Moontower and more. Houdini even made an appearance, surrounded by vaudevillian performers, jugglers, stilt walkers, magicians and over 300 guests! 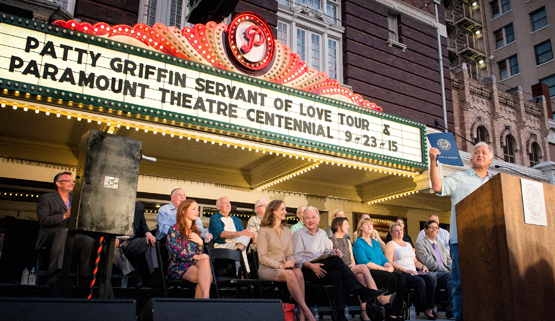 The Honorable Mayor Steve Adler decreed October 11th as “Paramount Theatre Day” in Austin, and recognized the theatre for its lasting presence on Congress Avenue. Erik Stanley and Cate Barrett were the winners of the 9th Annual Break-A-Leg 5K. Join us next Valentine’s Day when we run again as the official 5K of the Austin Marathon and Half Marathon presented by Freescale. Interested in running in 2016? Register here! ^ Paramount 5k Break-a-Leg from ps peeples on Vimeo. Our annual Advisory Council party was held this year at the beautiful home of Amanda and Brad Nelsen. Special guests included, Glee‘s Jane Lynch and The Office‘s Kate Flannery. As a tribute to the Paramount’s rich cinematic history, the theatre hosted four free-to-the-public film screenings during its 100th-birthday year. More than just a remembrance of the films and filmmakers that have graced the Paramount’s screen and stage over the decades, these four special evenings served as the theatre’s gift to all the Austin movie lovers who continue to support the theatre each and every year. From classic Hollywood greats to contemporary Austin filmmakers, these four films encapsulated both the past and present of the Paramount’s love affair with the movies. 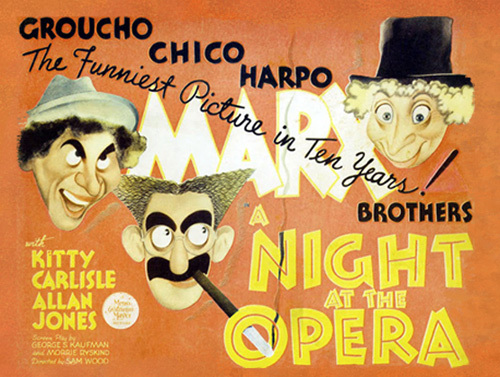 With over 250 in attendance, April Fool’s night became a tribute to the many famous acts who passed through the Paramount during its vaudeville days, including an actual live performance by the Marx Brothers. In memory of Katharine Hepburn’s visit to the Paramount to perform live in the stage version. We had 500 patrons join us for the film which was the same night as co-star, Jimmy Stewart’s birthday. Austin film director, Richard Linklater visited the theater to discuss his film, Me and Orson Welles, and recount his own memories of the Paramount over the years, with 400 in attendance. Filmmaker Robert Rodriguez brought his iconic film From Dusk Till Dawn roaring back into the Paramount Theatre, a reminder to the 400+ movie lovers in attendance of the many times his films have graced that screen over the years. 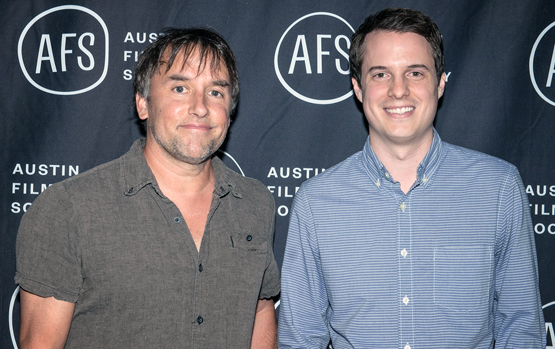 ^ Film Director, Richard Linklater and Paramount Film Programmer, Stephen Jannise. 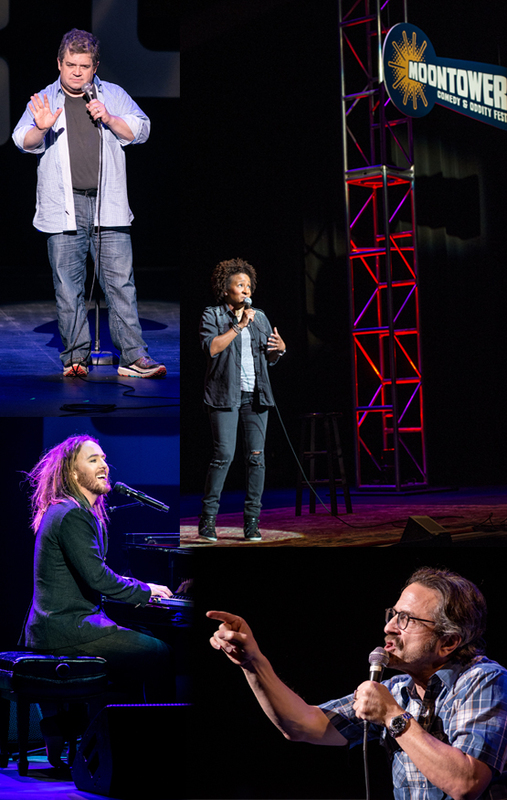 The fourth annual Moontower Comedy Festival returned for four nights, in ten venues, with 80 comedians and over 100 performances! 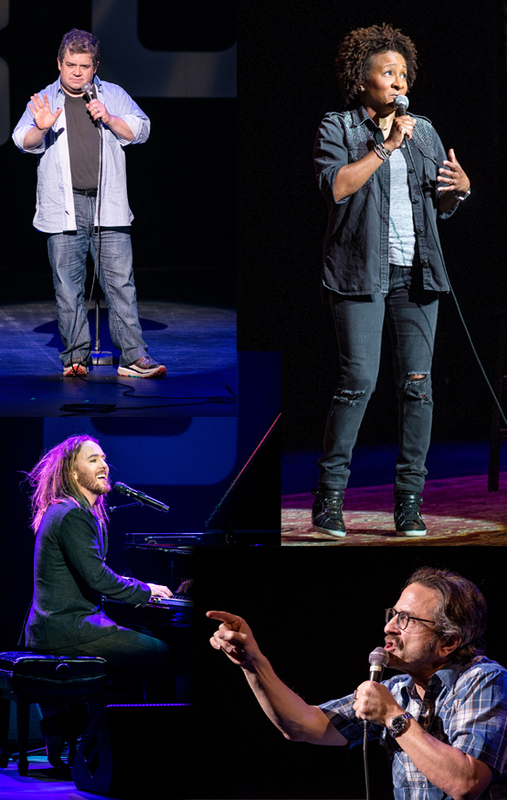 Headliners included John Mulaney, Tim Minchin, Patton Oswalt, Wanda Sykes, Maria Bamford and more. 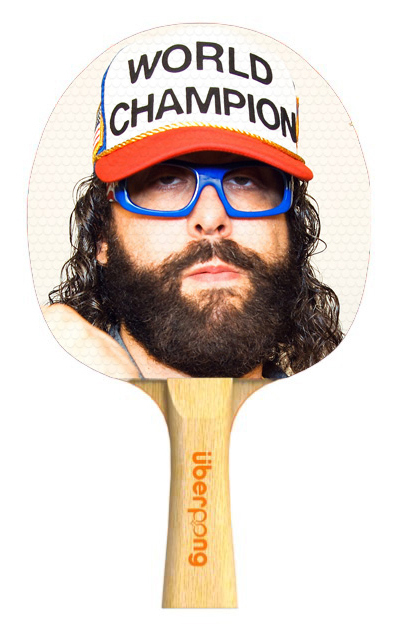 We also hosted our ever-growing Comedy Central Moontower Ping Pong Slapdown featuring live commentary from the Sklar Brothers, and an appearance by Judah Friedlander aka: The King Kong of Pong (pictured below). Mark your calendars for Moontower 2016 happening April 20 – 23rd! The Centennial Gala welcomed Lyle Lovett with Patty Griffin, Allen Toussaint and Warren Hood. It was a record-breaking night, bringing in over $1.2M in revenue. 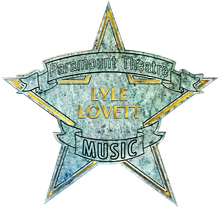 The music, setting and celebration were a sight to see, including an unveiling of a new star on Congress Avenue honoring Lyle Lovett. It was truly an evening from another era as guests arrived in period costumes and embraced the once-in-a-lifetime celebration. The Blade Relighting Ceremony was magical and a fitting toast to the year. Thank you to each and every one of you for the support, time, energy and funds you have dedicated to this important year for the Paramount Theatre! Seeing longtime volunteer usher, Flo Henderson, flip the switch on the new blade made for an emotional and historic night! In addition, we held six private parties serving nearly 400 people, a public street event with over 1,000 attendees, and followed it all up with a sold-out Patty Griffin concert. 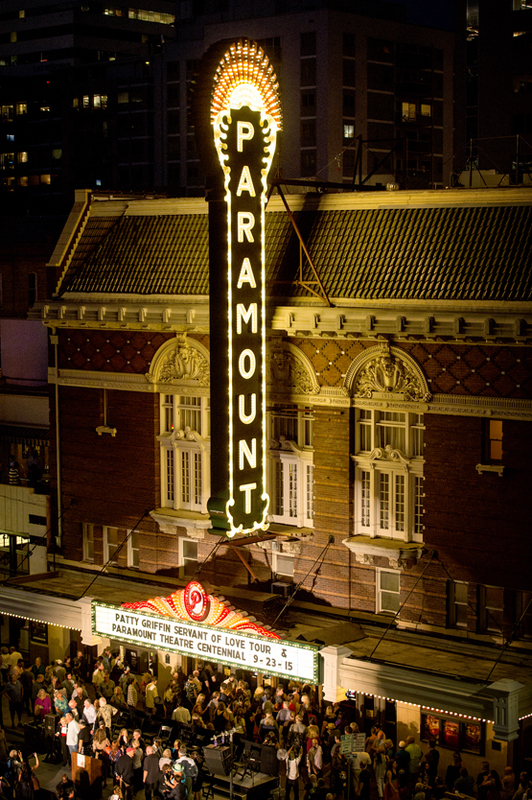 We encourage you to take time and visit the exclusive, history-focused website www.paramountaustin.org. 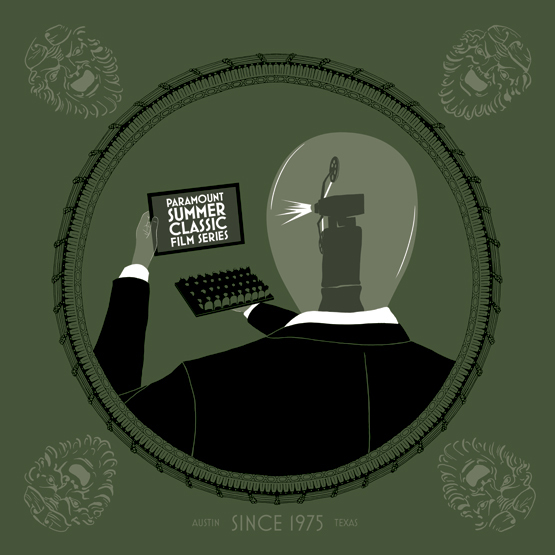 Thank you to Proof Advertising for their due diligence in uncovering many unknown stories, and launching this beautiful site dedicated to the various eras, renovations and reinventions of the Paramount’s past. Pro Tip: make sure your sound is on to enjoy the full experience of our Centennial Website. 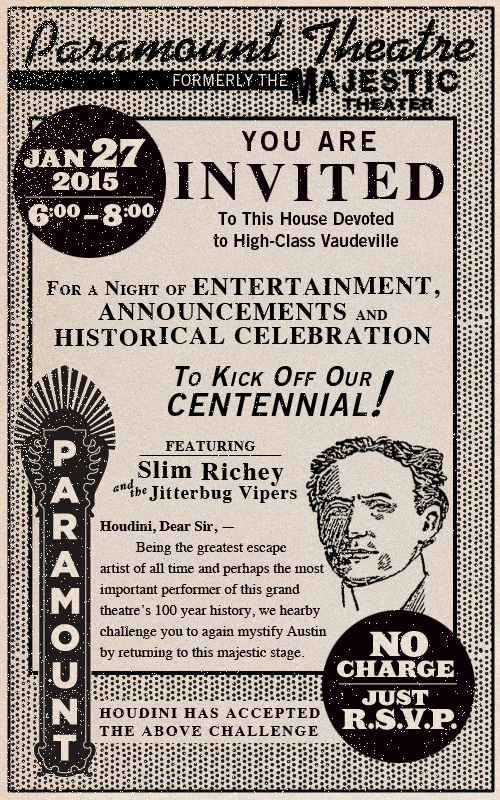 For more history, visit our Centennial site at www.paramountaustin.org. You can also click here to download a PDF of our 100-year brochure. Download a bundle of a high resolution theatre photos. For any other inquiries, please email info@austintheatre.org.